The staff was very friendly and helpful. The facility was awesome. You can keep as busy as you want to as there are a lot of activities they offer. The only complaint that I had was about my site. I had to take a wired brush to clean up the water spicket so my hose could attach. The sewer connection was broken but I was able to jam my hose to it. The lost was unlevel. I needed to place wood under one side of the rigs tires. The rated was based on the TT trails collection option. I would stay there again. 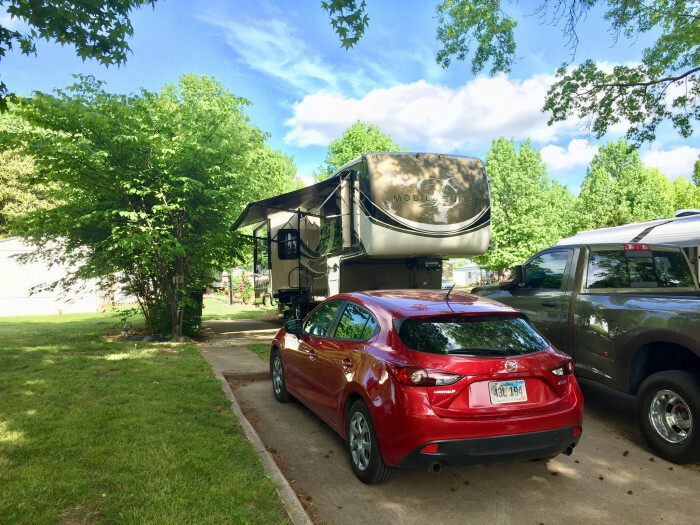 We camped at Voyager RV Resort & Hotel in a Fifth Wheel. Roads are a little tight (turns) Water 30 psi, shared spigot. My 35 foot hose just made it. Electric 125 volts Sewer hose will not screw on because it is in a concrete bowl Site not level (Wheels off the ground) and soft as my 5vers wheels sunk in about 2 inches into the ground. ABC is the only OTA channel, no cable AT&T and Verizon 3 bars Price based on a Monthly rate (4 weeks not 30 days) $962 (34.36 per night) I was billed for 30 days but only given 28. The new owners are very friendly. They just bought it a couple of months ago. We camped at Keyser Pond Campground in a Fifth Wheel. The staff was very friendly. We had a large level site. First time in a while that my wheels did not leave the ground. Water pressure was 45psi. AT&T and Verizon were 2-3 bars. 2 major networks OTA TV. Laundry was clean, great shape and only $2.25 total for the washer and drier. Rate is PPA plus you pay for metered electric at $.20 kWh. I would stay here again. We camped at Twin Ells Campsites & Mobile Home Park in a Fifth Wheel. This campground is very clean and very well maintained. The staff is very friendly. Water pressure was 75psi, AT&T and Verizon were 2-3 bars. No OTA tv, but cable is included. My only complaint is that I had to pay $28 additional for a car that fit in the site that I was given. I was also surprised that they did not offer a weekly or monthly rate. I had to move to a site with no sewer about half way as the first site was booked. There rate was the same, so opt for full hook-ups as it costs the same. We camped at North Pole Resorts in a Fifth Wheel. There is not weekly or monthly rate available. My rate included 1 night PPA. It was tight maneuvering to park our 5ver. We also missed the over head power lines by inches. The electric is ONLY 30 amps. The staff was friendly. We camped at Lake George Campsites in a Fifth Wheel. My rate was based on a weekly rate. The staff is very friendly and polite. They have a quaint general store that sells hand dipped ice cream and several other things. Verizon and AT&T were 2 bars. OTA TV- no major networks. There WiFi peak was 7.5 Mbps down. They just added 5GHz to there network. Water pressure was around 50psi. Follow there directions to the campground. I would stay again with out hesitation. This campground is across the street from Cummins Falls. We camped at Old Mill Camp at Cummins Falls in a Fifth Wheel. Kroger, Walmart and Sams Club are about 20minutes away. And of coarse Cummins Falls. When I plugged in and starting setting up, my wife asked if I cut the power. It was the Progressive Industries EMS cutting the power to the rig. One of the legs would fluctuate from 100-112volts. I was moved to a different site and had the same readings. The maintenance guy was kind and said that he would do what he could to make it right. The office people said that if I wanted to leave they would refund me. I found out that the 400 amp transformer was trying to keep up with a 500 amp demand. All this in 96 degree heat. I do not think I will be returning to this campground. 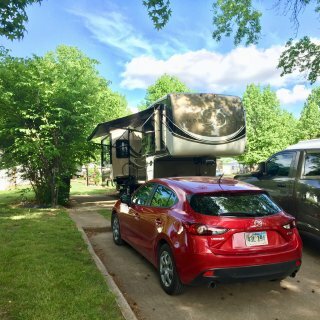 We camped at Tom Sawyer's Mississippi River Park in a Fifth Wheel. Make sure that you ask for clean and proper power. As low voltage can effect your electronics and cause your electrical motors to over work. This is a city owned park. Easy access to the park. The spaces are tight but it is easy to maneuver with in the campground. The lots are concrete pads or gravel. All of the utilities where in good working order. OTA TV- you will get 1/2 of the majors. ATT- good signal. Verizon - good signal. Great location and right at the pedestrian bridge that takes you to the Clinton Library. I would stay here again. My rate was with Passport America. We camped at Downtown Riverside RV Park in a Fifth Wheel. The owner is very friendly and help full. Easy access from the highway and close to lots of businesses. OTA- NONE, but free cable is provided ATT - good signal Verizon - good signal I would stay here again. We camped at Ivy's Cove RV Retreat in a Fifth Wheel. This park is mainly Mobile homes. But as they go, he turns those lots into RV lots. The park is clean and well maintained. All of the sites are large back ins with a large concrete patio. Each site has 2 parking spaces in front of your camper. TV - good over the air reception AT&T - good signal Verizon- good signal Great proximity to a lot of things. The only negative thing is that the city water pressure there is about 45psi. The manager/owner of the park is very kind, friendly and helpful. He is constantly updating the park. I would not hesitate to stay there again. We camped at Trailwood Mobile Home & RV Park in a Fifth Wheel. Water pressure is 70psi Electric 121 volt, but only 30 amps No over the air tv, but they offer cable. Not sure how good it is as we did not hook up to it. Had a covered picnic table at the back of the site, but the table really should be replaced. The campground has three entrances. If you are a big rig I would enter the campground from 5th St. If you read the other reviews, they are correct about the management. Think of him like the soup nazi of Seinfeld. He questioned the way I entered the park and parked. Not knowing how tall and long I was and how far my slides went out. I was almost at the point of leaving. As he states "he had been there for 25 years and this is not his first rodeo." And he did not know that I have been a full timer for over three years. So I am not a newbie at this and know my rig. I would not stay there again. Regular rate is $25.00. We camped at Overland Trail Campground in a Fifth Wheel. I think this is the best state park that I have stayed in. Everything was in good shape and working order. It was clean and well maintained WiFi was 1-3 Mbps and that is with only a few campers in the park. We camped at Poverty Point Reservoir State Park in a Travel Trailer. There is a public golf coarse called Black Bear Golf Club, best looking public coarse I have seen. There is a Mexican restaurant down 80 to the left that was very good. All of the hook ups were in good working order. The park was clean and all concrete roads and pads. Good location with easy on and off I20. My site and all of the other sites were not level. Rigs were either jacked up or slammed to the ground on one end. Most of the trees drop some sort of acorns. We camped at DiamondJacks Casino and Resort in a Fifth Wheel. We stayed in site #27. The road going to the CG had low branches. The paved road in the park was narrow. Had lots of grass burs, kept our shoes outside. Lots of red ants. Water pressure was 80-105 psi. Many OTA channels. 2-3 bars Verizon and ATT. The new owners were friendly and said that they have made a lot of improvements since they bought it. We have a 40 ft 5th wheel with 4 slides. We camped at Palestine RV Park in a Fifth Wheel. If you go there plot the Brookhollow vet clinic and then the camp ground. Nice view of the lake. Owner and staff were very friendly and kind. My two complaints are, The water spicket is below ground level. We had a LARGE black ant infestation. This was the main reason for my low score. We camped at Safe Harbor RV Park in a Fifth Wheel.